Organic Sales: 85%-90% of total store sales are organic. For the past three to four years, new products have been vetted for suspect products. Foods that are likely to contain GMOs because they contain corn, sugar beets, soy - crops that are predominantly GMO - must be certified organic. The store does carry some likely-to-contain GMO foods, but the owners are weeding them out over time, which Sue acknowledged is a difficult and time-consuming process. The Co-Op is a Non-GMO Project Participating Retailer. How great to find your name on this list! 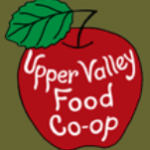 Congratulations for all the work that goes into making the UVFC the best place to find good food in the Upper Valley – and beyond! Keep up the good work, I shop and love your place, when I am passing through the area. Always have a cooler when I am in the area. I live in Warner NH so not too far away.